The fourth annual Federal Frenzy was held Saturday, filling West Federal Street with an array of music, art and various vendors. 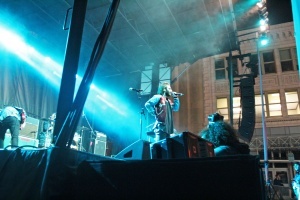 The mainstage was a makeshift platform placed near the center of downtown. Performers included Clevelanders FreshProduce and Carlos Jones and the Plus Band, as well as local rockers The Vindys and the headliners, Smallpools. Starting their journey in Los Angeles and eventually making Nashville their home, Smallpools has gained a substantial following of fans since forming in 2013. Guitarist Michael Kamerman said the progress the band has made since forming is surprising, and everything that’s happened since has just felt like a whirlwind. 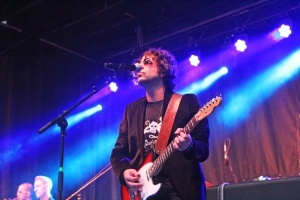 Drummer Beau Kuther accredited some their success to timing. “Our style was really popular when we started, so it was just the right time for the sound,” Kuther said. This was the band’s first time performing in Youngstown. The group agreed any show that’s not in their different hometowns is always a little less stressful. “When you play in your hometown, you have to make sure that you [meet their expectations] which always makes things more hectic,” Kamerman said. If this is the case, most of the acts at Federal Frenzy were under added pressure. On top of this, one act was performing for the first time. The Pella Penguins are an a capella group from Youngstown State University. The group name has been around for a couple years, but this was the first performance for this particular group. Anna Maria Jadue is the founder of the group. She said these singers started practicing together in January. Jadue said the group is comprised of only a few students majoring in vocal performance, and the rest are just students with a passion for singing. 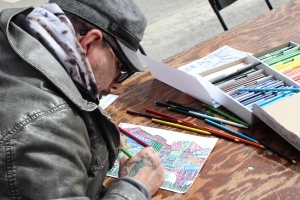 The artist and vendor side of the festival included artists creating pieces on canvas and the street of portraits and realistic pieces, and clothing companies such as Youngstown Clothing Company and Misprint Apparel. Rachel Hritz spent her first time at Federal Frenzy creating a street portrait of Prince in remembrance of the second year since his passing. Hritz said she frequently does pieces like this which she defined as pop art. Her work will be more prevalent downtown and on campus next year when she enters her freshman year at YSU as an art major. A vendor who was there for their second year was Kate Miley. At her end of the tent of roughly eight vendors were a selection of bracelets, necklaces and magic wands. Miley began selling her crafts after her boyfriend suffered a brain injury and she needed an extra source of income. She had a fair amount of buyers the previous year and her hope was to receive the same response. 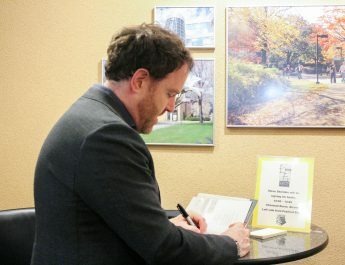 The event is a loud and artistic bookend for the spring semester. Penguin Productions is holding a sounding board May 1 to hear ideas of what acts people want to hear in the next school year.